If you like your proteins from soy, you already love tofu, natto and miso, important traditional foods here in Japan since a long time ago. But much of that soy is imported. No! GMO Campaign initiated a campaign some 15 years ago to encourage farmers to grow the beans again, and educate people about the importance of local consumption. On February 15, 2013, a meeting was held with expert Makushita Keiki and others, to take a look at the progress so far. Yes, consumption of locally grown soy is increasing. But still, Japanese consumers are depending to a very large extent on imported soy. Take a look at the graph: Of all the soy used, some 27% are used directly as food (while 68% is used for food oils, some of which is later used as animal feed). 5% goes to seed and other uses. The interesting part is the soy used for food: some 22% comes from domestically grown soy, while 78% is imported (from North and South America, and possibly China). This data does not say anything about the amount that is organically grown, and there is also a portion of imported soy that is Identity Preserved (IP) and thus qualifies as non-GMO. 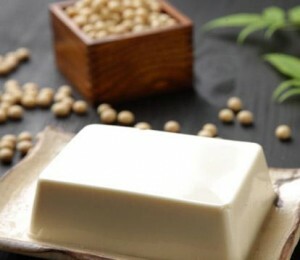 Of the soy grown locally in Japan, most comes from Hokkaido. 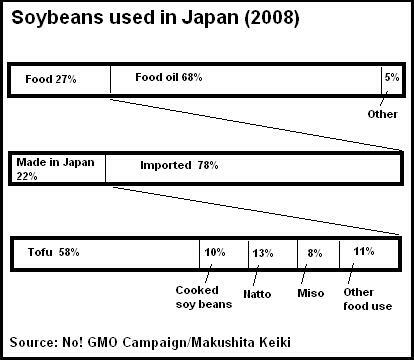 58% of the domestic soy goes to tofu, 10% to special cooked bean dishes, 13% to natto, 8% to miso (for soup mostly). Some 11% goes to soy meal used for special traditional products, especially sweets. Look for the 国産 (kokusan) label if you want to support the movement to grow more soybeans in Japan! Read more about food labels over at The Ultimate Guide to Reading Food Labels in Japan! However, in a news conference in response to this, Prime Minister Abe mentioned that there was no explicit promise regarding tariff sanctions during his meeting with President Obama. Meanwhile, the governing coalition of LDP and New Komeito is leaning towards announcing that Japan will participate in the TPP negotiations as early as possible. Prime Minister Abe has then gone on to talk about formally announcing participation in TPP negotiations during speeches in the Upper and Lower House Parliament sessions on February 28, 2013. This is in sharp contrast to the LDP election promises during last December’s general election, to oppose Japan’s participation in the TPP negotiations if abolishing tariffs without restriction becomes a precondition. Five conditions were included in LDP’s election manifesto, including protecting the country’s health insurance system, which covers all citizens, and food safety standards, as well as not accepting numerical targets for imports of cars and other manufactured products. LDP also promised it would not liberalize financial services or rules regarding public procurement. The TPP also stipulates a new type of dispute resolution system, known as Investor-state Dispute System (ISD) that will allow foreign corporations or financial investors to sue governments in other countries. The comment by the Prime Minister only five days after his meeting with the US President can only be construed as an absurd violation of LDP’s election promises in key areas. We regard it as unacceptable that such infringements of the rights of people can be proposed, that will infringe on our lives and all aspects of society. This is related to governance and Japan’s national structure, its politics, and issues related to important national policy-making. We strongly protest against your actions.